Note: this Renascence Editions text was transcribed by Risa S. Bear, November 2002, from The Booke of haukynge, huntyng and fysshyng, with all necessary properties and medicines that are to be kept, Tottel, 1561 [STC 3312], with an omission of matter restored [[within double brackets]] from the edition of Wynken de Worde, 1496. Typographical errors have been emended within brackets. Printer's contractions for words containing "m" or "n" have been expanded within brackets. Any errors that have crept into the transcription are the fault of the present publisher. The text is in the public domain. Content unique to this presentation is copyright © 2002 The University of Oregon. For nonprofit and educational uses only. Send comments and corrections to the Publisher, rbear at uoregon.edu. tyse of fysshynge wyth an Angle. SAlomon in his parables sayeth that a good spyrite maketh a flouring age that is a fayre age and a longe. And sythe it is so I aske this question, whiche be the meanes and the causes that enduce a man into a mery spyryte? Truely to my best discretion it semeth good disportes and honest games in whom a man ioyeth without any repentaunce after. Then foloweth it that good disportes and honest games: be cause of mannes fayre age and longe lyfe. And therfore nowe we wyll I chose of foure good dysportes and honest games, that is to wete of Haukyng, Huntyng, and fyshyng, and for foulyng. The best to my discrecion whiche is fyshying called anglyng with a rod, and a lyne, and an hoke, and therof to treat as my symple wyt may suffyse, both for the sayd reason of Salomon, & also for the reason that reason maketh in this wyse. Si tibi deficiant medici, medici tibi fiant. Hec tria, mens leta, labor, et moderata dieta. Ye shall vnderstande that this is for to say, if a man lackes leche or medicine, he shall make thre thynges his medicine and he shall neuer need moe. The first of them is a mery thought. The seconde is a labour not outragious. The third is diet mesurable. The first if a man will euer more be in mery thought and haue a glad spyrite, he must eschew all contrarious company and all places of debate where he myght haue any occasions of melancholy, & if he wyll haue a labour not outragious: he must then ordeyne hym to his hartes ease, and plesaunce without study, pensyfnes of trauayle, a mery occupacion whiche may reioyce his harte, and in which his spirites may haue a mery delyte. And if he will be dieted measurably he must eschewe all places of ryot, whiche is cause of surfet and of syckenesse, and he must drawe hym to places of swete ayre and hungry, and eate nouryshable meates and disyrable also. AS now than wyll I descryue the sayd disportes and games to fynde the beste of them as berely as I can, all be it that the ryght noble and full worthy prynce Duke of Yorke late called mayster of the game, hath discryued the mirthes of huntyng like as I thinke to discryue of it and of al other. For huntyng as to mine intent is to laborous. For the hunter must alway tunne and folowe his houndes traueling and sweting ful sore. He bloweth till his lyppes blyster. And whan he weneth it be a hare: full oft it is an hedgehogge. Thus he chaseth and woteth not what. He commeth home at euen rayne beten, pycked, and his clothes torn, wete shod and all myrde. Some hounds lost, some surbate. Suche greues and many others happeth vnto the hunter, whiche for displeasaunce of them that loue it, I dare not reporte. Thus truly me semeth that this is not the best disporte & game of the said foure. The disport & game of Hauking is laborous & noyus also as me semeth. for as ofte[n] the faukener leseth his haukes, as the hunter his houndes, than is his game & disporte gone, often cryeth & whysteleth til he be ryght euill a thrust. His hauke taketh a bow & list not ones on him to regarde. Wha[n] he would haue her to fle: tha[n] will she bath. With misfeeding she shall haue ye frou[n]ce ye rie ye cray & many other sicknesses yt bringeth the[m] to souse. Thus by profe this is not the best disporte & game of the sayd fo[u]re. The disport and game of foulyng me semeth moste symplest. For in the wynter season the fouler speedeth not, but in the hardest and coldest of the wether whiche is greuous for whan he would go to his ginnes he may not for colde. Many a gin & many a snare he maketh, yet sorely doth he fare, at morne tide in ye dells he is welshod vnto his taile. Many other such I could tel but dred of maugre maketh me to leue. Thus me semeth that huntyng and haukyng, and also foulyng, ben so laborous & greuous, that none of them may perfourme nor be very meane to enduce a man to a mery spyryte whiche is cause of thys longe lyfe according vnto the sayd parable of Salomon. Doubtles then foloweth it that it muste needes be the disport of fyshyng with an angle. 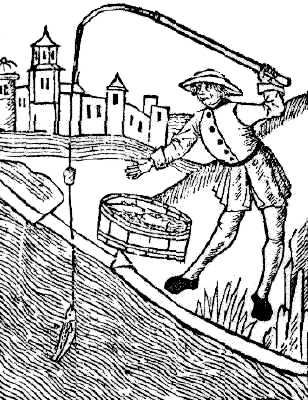 For all other maner of fysshynge is also laborous and greuous, often makyng of folkes ful were and colde which many tymes hath ne seen cause of greate infirmities, but the angler maye haue no colde nor dysease nor angre, but yf he be causer hym selfe, for he maye not lose at the mooste but a lyne or an hooke: of which he may haue store plentye of hys owne makynge, as thys simple treatyse shall teache hym. So then hys losse is not greuous, and other greefes maye he not haue sauynge but yf any fysshe break away after yt he is taken on the hooke, or els yt he catch nought whyche is not greuous, for yf he fayle of one he maye not fayle of an other, yf he doth as thys treatyse teacheth, but if there be nought in the water, and yet as the least he hath his holsome walke and mery at his ease, sweet ayre of the sweet sauour of the medow floures that maketh him hungry. He heareth the melodious armony of foules. He seeth the yonge swans, herons, duckes, cootes, and many other foules with their broodes, whyche me semeth better then all the noyse of houndes, the blastes of hornes, & the scry of foules, that hu[n]ters, faukeners, & foulers ca[n] make. And if the angler take fyshe: surely then is there no ma[n] meryer then he is in his spirite. And who so wyl vse thys game of anglyng: he muste ryse early, which is profytable to man in this wyse. That is to wete, most to to the health of hys soule. For it that cause hym to be holy, & to the helth of his body for that it shal cause him to be whole. Also to the encrease of hys gooddes, for it shall make hym ryche; as the olde Englysh prouerbe sayth in this wyse. W[h]o so wyll ryse early, shalbe holy, helthy, & happy. Thus haue I proued in myne entent that the disporte and game of angling: is the very meane and cause that enduceth a man into a mery spyrite, Which after the sayd parable of Salomon and the sayd doctryne and the Physicke maketh a stourynge age and a long, and therefore to all you that ben vertuous gentyll and fre borne, I wryte & make this simple tretise folowing by the which ye may haue the full craft of angling to disport you at your lust to thentent that your age m[a]y the more floure, and the more longer endure. IF ye wyl be crafty in angling, ye must first learne to make your harneys, that is to wete your rod, your lines of diuers colours, after that you must know how ye shall angle, in what place of the water, how depe and what time of the daye, for what maner of fysshe, in what wether, how many impedimentes there bene of fysshyng that is called anglyng, and in specially wyth what baytes to euery dyuers fyshhe, in euery moneth of the yeare[.] How ye shall make your baytes breed, where ye shal finde them, and how ye shall fynd them, and how ye shall kepe them and for the moost crafty thyng, how you shall make your hookes of stele and of osmonde. Some for the dub and some for the flote on the ground. And howe you shall make your rod craftely, here I shall teache you, ye shall cut betweene Michelmas & Candelmas a fayre staffe of a fadome and a halfe longe and arme great of hasyll, wyllowe or aspe, and breath hym in a hote ouen, and set hym euen. Then let hym coole and drye a moneth, take then and frete hym fast wyth a cokshote cord, and bynde it to a fourme of an euen square great tre. Then take a plummer wyer that is euen and strayght, and sharpe at the one ende, and heate the sharpe ende in a charcole fyre tyll it be hote, and bren the staffe therewith through, euer streyght in the pith at both endes tyll they mete, and after that bren him in the nether end with a byrde broche, and with other broches eche greater then other and euer the greatest the last, so that ye make your hole aye taper wyse. Then let hym lye styl and kele two dayes, vnfrete hym then and let hym dry in a house roofe, in the smoke tyll he be through drye[. I]n the same season take a fayre yerde of grene hasell, and bathe it euen & strayght and let it dry with the staffe and when they ben drye make the yerde mete vnto the hole in the staffe vnto half the length of the staffe, and to perfourme that other halfe of the crop, take a fayre shote of blacke thorne, crab tree medler or els of Ienepre cut in the same season, and well bethed, and streyght, and set them together fetely, so that the crop may iustly enter all into the sayde hole. Then shaue your staffe and make hym capre waye, then vyrell the staffe at both endes with long hoopes of yron or larton, in the clennest wyse, a pyke in the nether ende fastened with a rennyng vyce, to take in and out your crop. Then set your crop an handfull within the ouer ende of your staffe, in suche wyse that it be as bygge there as in any other place aboue, then arme your crop at the ouer ende downe to the fret with a lyne of syx heates, and double the lyne and frete it fast in the toppe with a bowe to fasten on your lyne. And thus shall ye make you a rod so pryuy that ye may walke there with, and there wyll neuer any man wete what thyng ye go about. It wyll be very lyght & nymble to fyshe with at your pleasure, & for the more redynes, lo here a fygure therof in example. AFter ye haue thus made youre rodde: ye muste learne for to colour your lynes of heare in this wyse. First ye must take of a whyte horse tayle the longest heare and fayrest that ye can fynde, and euer the rou[n]der that it be: the better it is. Departe it in syxe partes, & euery part ye shall colour by him selfe in diuers colours as yelowe, grene, browne, tawny, russet, & duske coloure. And for to make good greene coloures on your heare, ye shal do take smale ale a quarte, and put it into a litle pan and put therto halfe a pounde of Alum, and put therto your heate and let it boyle softly halfe an houre. Than take out your heare and let it drye, than take a pottell of fayre water and put it in a pan and put therin two handes full of Wyxene, and presse it with a tyle stone, and let it boyle softly the space of an houre. And whan it is yelowe on the scum: put therein your heare, with halfe a pounde of coperose beaten in pouder, and lette it boyle halfe a myle waye. And than set it downe and let it kele fyue or syxe houres. Than take out the heate and drie it, and it is than the fynest greene that is possible to be had for the water. And euer the more that ye put therto of cuperose the better it will be, or elles in the stede of it Vert-grese. And an other way may ye make a bryghter greene, as thus. Lette wod your heare in a wodden fat of lyght plunket colour and than set hym in olde or wyxen lyke as I haue shewed you before, sauyng ye shall not putte therin neyther coperose or vertegrees. For to make your heare seme yelowe, dight it with Alum as I haue sayde before, and after that with oldes or Wyxen without coperose or vertgrece. An other yelowe ye shall make thus. Take smale ale & pottle, and stampe thre handfull of walnut leues & put it together, and put in your heare tyll that it be as deep as ye wyll haue it. For to make russet heare. Take a pynte of strong lyes & a half pound of soote, and a lytle iuce of walnut leues and a quart of Alum, & put them all together in a pan, and boile them wel, and whan it is colde: put in your heare till it be as darcke as ye wyll haue it. For to make a browne coloure. http://www.luminarium.org/renascence-editions/poems/dingbat.gif Take a pounde of soote & a quarte of ale, and seeth wyth as many walnut leues as ye may, and wha[n] they be blacke set it from the fyre, and put therin heare & let it lye styll til it be as browne as ye wyll haue it. For to make an other browne. Take strong ale, and soote and tempre the[m] together and put there to your heare two dayes and two nyghtes, and it shal be a ryght good coloure. For to make a tawny coloure. Take lyme and water & put them together, and also put your heare therin foure or fyue houres. Tha[n] take it out and put it into a tanner sole one daye and it shal be as fine a tawny coloure as any nedeth to our purpose. The sixe parte of your heare ye wall kepe styl white for lines, for the double hooke to fysshe for the troute & graylynge, and for small lynes for to lye for the roche & the Dase. WHan your heare is thus coloured: ye must know for whiche waters and for which seasons they shall ser[u]e. The greene colour in all cleare waters from Apryl unto Septe[m]ber. The yelow colour in euery clere water, from Se[p]tembre to Nouembre for it is lyke to the wedes and other maner of grasse whyche groweth in the waters and ryuers whan they be broken. The russet colour serueth al the wynter vnto the ende of Apryll, as well in ryuers as in pooles, or lakes. The browne colour, serueth for that water that is black dedish in ryuers or other waters. Then tawny colour, for these waters that ben hethy or morysh. NOw must ye make your lynes, in this wyse. Fyrst looke ye haue an instrument lyke vnto this fygure portrayed folowyng. Tha[n] take your heare and cut of the ende an handfull large or more. For it is neyther stronge nor sure. Than turne the top to the tayle, euery one like much and departe it into three partes. Than knyt euerye parte at one ende by hym selfe, and at the other ende knytte all three together. And than put the same ende in that other ende of your instrument that hath but one clyft. And than set that other ende fast with the wedge foure fyngers in all shorter than your heare. Than twyne euery warpe one waye, and lyke muche, and fast them in the clyftes alyke streyght. Take that out at that other ende, & than twyne it that waye that it wyll desyre enough. Than strayne it a lytle and knyt it for vndoyng and that is good. And for to knowe howe to make your instrument: lo here a fygure[.] And it shalbe made of tree, sauyng the bolte vnderneth, whiche shalbe of yron. SO whan you haue as many of the lynkes as ye suppose wil suffyse for the length of a lyne: than must ye knyt them together with a water knot, or els a duches knot, and when your knot is knyt: cut of the voyte short endes a straw bred fro the knot. Thus shall your lynes be fayre and fyne, and also right sure for any maner of fysshe. YE shall vnderstande, that the moste subtill and hardest craft in makyng your harneys, is for to make your hookes. For whose makyng ye must haue feete toles thyn and sharpe and small beaten, a semy clam of yron, a bender, a payre of long and small tones, and an harde knyfe somedely thyke and an anuylde, and a lytle hamner. And for small fysshe, ye shall make your hookes of the smallest quarell nedilles that ye can fynde of stele, and in this wyse ye shall put the quarell in a read charcole fyre, tyll it be of the same coloure that the fyre is. Than take hym out and let hym kele, and ye shall fynde hym well allayed for to fyle. Than rayse the barde with your knyfe, and make the poynt sharpe. Than alay him agayne or els he will breake in the bendyng. Than bende hym lyke to the bende accordyng to the purpose. And greater hookes ye shall make in the same wyse of great nedles, as broderers nedelles, or taylers, or shoomakers nedles, spere pointes of shoomakers nailes, in especiall the best for greate fysshe, and loke that they bend at the poynt wha[n] they ben assayed, for els they be not good. whan the hoke is bended bete the hinder ende abrode, and fyle it smothe for fretting of the lyne. Than put it into the fyre agayne, & geue it an easy read heate. Than sodonly quenche it in water, and it wyll be harde and strong. And for to haue knowledge in your instruments: loe they be here in figure portrayed. WHen ye haue made your hookes: then must ye set them on your lynes accordyng in greatnes and strength in this wyse, ye shall take small read sylke, and if it be for a great hooke then dowble it not, twyned. And els for small hookes let it be syngle, and therewith frete thycke the lyne there as the one ende of your hooke shall fyt a strawe breade. Then set there your hooke and freete him with the same threde the two partes of the length that shalbe fret in all. And when ye come to the thyrde part: the[n] turne the ende of your lyne agayne vpon the fret double, and frete it so double at the other thyrde parte, then put your threde in at the hole twyse or thryse, and let it goe eche tyme round aboute the yerde of your hooke, then were the hole and drawe tyll it be faste, and looke that youre lyne lye euermore within your hookes, and not without, then cut of the lynes ende and the threde, as nyghe as ye may sauyng the frete. So ye knowe with howe great hookes ye shall angle to euery fysshe now I wyll tell you with howe many heares ye shall angle to euery fysshe. Fyrst for the Menowe with a lyne of one heare. For the waryng roche, the bleke, the Gogyn and the Ruf with a lyne of two heares, for the Darse and the great Roche with a lyne of thre heares. For the Perche with Flounder and Bremer with foure heares. For the Cheuyn chubbe, the Breme, the Tenche, and the Eele with six heares. For the Troute, graylyng barbell & the great cheuyn: with nyne heares. For the greate [troute] with twelve heares. For the Samon with fyftene heares, and for the pyke with a chalke lyne made browne with youre browne coloure aforesayde armed with a lyne as ye shall heare hereafter whan I speake of the pyke. Your lynes must be plummed with lead. And ye shall wete that the next plumbe to the hooke, shalbe therfro a large foote and more, and euery plumbe a quantitie vnto the greatnes of the lyne. There be the maner of plumbes for a grounde lyne rennyng. And for the flote set vpon the ground lyne lyeng .x. plumbes ioynyng all together on the ground line rennyng nyne or ten small. The flote plu[m]be shal be heuy that the first plucke of any fysshe may pull it downe into the water, and make your plumbes round and smothe, yt they stick not on stones or weedes, and for the more vnderstandyng, lo here be they in fygures. The ground lyne, rennyng and lyeng. The Flote lyne, and the lyne for Perche or Tenche. The lyne for a pyke, plu[m]be, corke, and armed with wire. THen shall ye make your flotes in this wyse. Take a fayre corke that is clene wtout any holes and bore it through with a small bore yron, and put therin a pen iust and streyght, euermore note the greater pen, and the greater hole. Than shape it great in the middes, and smal at both endes, and specially sharpe in the nether ende, and lyke vnto the fygures folowyng and make them smothe on a grydyng stone or on a tyle stone, and looke that floote for one heare be no more then a pease, for two heares as a beane, for twelue heares as a walnut, and so euery lyne must haue accordyng to his porcion. All maner lynes that be not for the grounde must haue flotes, and the rennyng ground lyne must haue a flote, the lyeng ground lyne must haue a flote. NOw I haue lerned you to make all your harneys[.] Here I wyll [tell you] how ye shall angle. Ye shall understande that there is syxe maner of anglyng. That one is at the ground for the troute and other fysshe. An other is at the grounde at an arche or a stange, where it ebbeth and floweth: for bleke, roche, and Darse. The thirde is with a flote for all maner of fysshe. The fourth with a menow for the Troute, without plumbe or flote. The Fyfth is rennyng in the same for the Roche and darse, with one or to heares and a flye. The syxte is a dubbed hooke, for the Troute or Graylyng. And for the fyrst and pryncipall poynt in anglyng: kepe the euer from the water for the syght of the fysshe, eyther ferre vpon the lande, or els behynde a bushe that the fyshe se you not. For if they doo: they wyll not byte. And looke that ye shadowe not the water as much as ye maye. For it is that thyng that wyll sone fraye the fyshe. And if a fysshe be a frayde: he wyll not byte long after. For all maner of fysshe that fede by the grounde ye shall angle for them to the bottome, so that your hooke shall renne, or lye on the grounde. And for all other fysshe, that fedeth aboue: ye shall angle for them in the mides of the water, or somdely beneth, or som dele aboue, for euer the greater fysshe: the nerer he lyeth to the botome of the water. And euer the smaler fysshe the more he swymmeth aboue. The thyrde good poynte is whan the fysshe byteth that ye be not to hasty to smyte, nor to late. For ye must abyde tyll ye suppose that the bayte be fer in the mouthe of the fysshe and then abyde no lenger, and this is for the ground. And for the floote, when ye se it pulled softly vnder the water, or eis caryed softly vpon the water, then smite. And looke that ye neuer ouersmite the strength of your lyne for breakyng. And if it fortune you to smyte a great fyshhe with a small harneys, then ye must lede hym in the water, and labour him there tyll he be drowned and overcome. Then take him as well as ye can or may, and euer be ware that ye holde not ouer the strength of your lyne[.] And as much as ye may let him not come out of your li[n]es ende streyght from you but kepe him euer vnder the rod, and euermore holde him streight so that your lyne may susteyne and beare his leapes and his plu[n]ges with the helpe of your crop and of your hand. HEre I wyll declare vnto you, in what place of the water ye shall angle, ye shall angle in a poole or in a landing water in euery place where it is any thing deepe. There is no great choyse of any place where it is any thyng depe in a poole. For it is but a pryson vnto all fysshes & therfore it is the lesse maistry to take them. But in a riuer, ye shall angle in euery place where it is depe and clere by the ground: as grauell or clay without mud or wedes, and in especiall if that there be a maner whyrlyng of water or a couert. As an holowe banke or great rootes of trees, or long weedes floting aboue the waters where as the fysshe may couer and hyde them self at certayne tymes when they lyst. Also it is good for to angle in depe styffe streames, and also in vallays of water and weares, and in flode gates or myll pyttes. AS now shall ye wyt, what tyme of the day ye shall angle. From the begynning of Maye vntill it be September: the byting tyme is early in the morow from four of the clocke vnto eyght of the clocke, at after none from foure to eyght also, but not so good as in the mornyng, and if it be a colde wynde and a lowryng day, it is muche better than a cleere daye. Also many poole fysshes will byte best in the morne tyde. And if ye se in any tyme of the day the Troute or greylyng lepe angle to him with a dub according to the same moneth. And where the water ebbeth and floweth: the fish wyll byte in some place at the ebbe and in some place at the flud after they haue restyng behynde stanges, and arches of brydges, and other suche maner places. HEre shal ye wete in what maner of wether ye shal angle in, as I sayd before in a darke louryng daye whan the winde bloweth softly. And in sommer seaso[n] whan it is brenning hote, than it is naught. From Septembre vnto Apryll, in a fayre sunny daye it is ryght good to angle: and yf the wynde in that season haue any parte of the Oryent wether: than it is naught, and whan it is great wynde whan it snoweth, rayneth, or hayleth, or is a great tempest, as thunder or lyghtnynge or a swoly hote wether: than it is nought for to angle. YE shall now wit that there be twelue maner of impedymentes whiche cause a man to take no fysshe, without other comyn that may casually hap. The fyrst is if your harneis be not mete, nor fetely made. The second is, if your baytes be not good nor fyne. The third is if that ye angle not in byting tyme. The fourth is if the fysshe be frayde with the syght of a man. The fyft if that the water be ve[r]y thycke, whyte or read of any floude late fallen. The syxt if the fysshe stere not for colde. The seuenth, if that the wether be hote. The eyght, if it rayne. The .ix. if it hayle or snowe. The .x. if it be tempest. The .xi. if it be great wynde. The .xii. if the wynde be in the east, and that is worste. For commonly neyther wynter nor somer the fysshe wyl not byte than. The west and the north wynde ben good, but the south is best. ANd nowe I haue told you howe to make your harneys, and howe ye shall fysshe therewith in all poyntes: reason wyll that ye knowe with what baytes ye shall angle to euery maner of fysshe in euery moneth of the yere whiche is all the effect of the craft. And without whiche baytes: knowe[n] well by you, all your other crafte here toforne auayleth you not to purpose. For ye cannot brynge a hooke into a fysshe mouthe withoute a bayte, whiche baytes for euery maner of fysshe, and for euery moneth here foloweth in this wyse. AS now because[ ]that the Samon is more statelye fysshe that any man maye angle to in fresshe water: Therfore I purpose to begyn at hym. The Samon is a gentyll fysshe, but he is cumberous for to take. For commo[n]ly he is but in depe places of great ryuers, and for the moste part he holdeth him in the myddes of it, that a man may not come at hym. And he is in season from Marche vnto Michelmas. In whiche season ye shall angle to hym with these baytes whan ye may get them. First with a red worme in the begynnyng and endyng of the season, and also with a grub that breedeth in a dunghill, and especially with a souerayne bayte that bredeth in a water docke. And he bydeth not at the grou[n]d but at the floote, also ye may take hym, but it is seldome seene with a grub at such tymes as whan he lepeth, in lyke fourme and maner as ye do take a Troute or a Gralyng, and these ben well proued baytes for the Samon. THe Troute for because he is a right deynteous fisshe and also feruent bitter, we shall speake next of hym. He is in season fro Marcshe vnto Mychelmas. He is on clene grauell grounde, and in a streame, ye may angle to hym at all tymes with a ground lyne, lying or rennyng, sauing only in leapyng time, and than with a dubbe. And erly with a rennyng grounde lyne, and forth on the daye with a flote line. Ye shal angle to hym in Marche with a menow ha[n]ged on your hooke by the nethernes without floote or plumbe drawyng vp and downe in the streme tyll ye feele him fast. In Iune take a red worme & nip of the head and a codworme before vpo[n] the hoke. In Iuly take the great red worme & the codworme together. In August take a flesh flye, and the great red worme, and the fat of the bakon, & bynde them together about the hoke. In Septembre take the read worme and the menow. In October take the same, for they be special for the trout at al tymes of the yere. From Apryll tyll September the troute lepeth tha[n] angle to hym with a dubbed hoke accordyng to the moneth whiche dubbed hookes ye shall fynde at the ende of this tratyse, and the monethes with them. THe Grayling by an other name called Umbre is a ryght delcious fysshe to mannis mouthe, and ye may take him as ye do the Troute, and these ben his baytes. In Marche & in Apryll the read worme. In May the greene worme, a lytle braised worme, the docke canker and the haut[h]orne worme. In Iune the bayte that breedeth betwene the tree and the barke of an Oke. In Iuly a bayte that bredeth on a ferne lefe and a great red worm and nyp of the head and put it on your hooke, and a cod worme before, in August the read worme and a Docke worme, and all the yere after a read worme. THe Barbell is a swete fysh but it is a qualy meat and perylous for a mans body. For commonly he gyueth an introduction to the febres. And yf that he be eaten rawe, he may be cause of mannes deth, whiche hath oftentymes bene sene. These be his baytes. In Marche and in Apryll take a fayre freshe chese, and laye it on the borde, and cut it in small square peces of the le[n]gth of your hooke. Than take a candell and brenne it at the ende at the poynt of the hooke vnto the tyme that it be yelowe, and than bynde it on your hooke with fletchers sylke, and make it tough lyke a welbede, this bayte is good all the sommer season. In May and Iune take the hautorne worme, & the great red worme, & nip of ye head and put vpon your hooke a cod worme before, and that is a good bayte. In Iuly take the read worme for chese, & the hauthorne together, also the water docke lefe worme together in August, and for al the yere, take the talow of a shepe, and soft chese of eche like much, & a lytel hony, & grinde or sta[m]pe the[m] together long & te[m]per it till it be tough and put thereto a lytell floure, & make it in small pelletes & that is a good bait to angle wt at the ground, & loke yt it sinke in the water, or else it is not good to this purpose. THe Carpe is a deinteous fishe, but there be but few in England, and therefore I wryte least of him he is an euill fyssh to take. For he is so strong enarmed in ye mouthe that there may no weke harneis holde him[.] And as touchyng his baytes I haue but lytle knowledg of it, and I were lothe to wryte more then I knowe, and haue proued. But well I know that the red worme and the menow ben good baytes for hym, at all tymes, as I haue heard saye of persons credyble, and also found writen in bookes of credence. THe cheuin is a stately fishe, & his head is a deinty morsell. THere is no fish so strongly enarmed wt scales on the bodye, and because he is a strong byter: he hath the more baytes which ben these. In Marche the red worme at the ground, for commonly then he wil bite there at all tyme of the yere, yf he be any thyng hungry. In Apryll the dyche Canker that breedeth in the tree, & worme that breedeth betwene the rynde and the tree of an oke. The red worme, and the yong frosshes when the feete be cut of. Also the stone fly, the bob vnder the cow torde, the read snayle. In Maye, the bayte that breedeth in the osyer lefe, and the docke canker together vpon your hooke, and a bayte that breedeth on a ferne lefe, the read worme, and a bayte that breedeth on a hauthorne, and a bayte that breedeth on an oken lefe, and a sylke worme, & a cod worme together. In Iune take the creker and the dorre, and also a read worm, the head cutte of and a cod-worme before, and put them on the hooke. Also a bayte in the osyer lefe, yong frosshes, the thre fete cut of by the body & the .iiii. by the knee. The bayte on the hauthorne, & the codworme together and also a grub that breedeth on a du[n]g hill, a great greshop and the humblebee in the medow. Also young bees, and young hornettes, also a great bre[n]deth flye that breedeth in pathes medowes, and the flye that is amonge pysmer hylles. In August take worte wormes, and magottes to Mychelmas. In September the read worme, and also take the baytes when yo[u] may get them, that is to wete, cheryes, and young myce not heared, and the house combe. THe Breme is a noble fyshhe, and a deynteous, and ye shall angle for hym from Marche vnto August with a red worme, and then with a butter flye, and a grene flye, and with a bayte that breedeth among greene reed, and a bayte that breedeth in the barke of a dead tree, and for bremettes take magottes. And from that tyme forth all the yeare after take the read worme, and in the ryuer brownebread. More baytes there be, not easy, and therefore let them passe. THe Tenche is a good fysshe, and healeth al maner of other fish that ben hurt if thei may come to him[.] He is moste part of the yere in the mud, and styreth moste in Iune and Iuly, and in other season but lytle. He is an euyll byter, and his baytes bene these for all the yeare, browne bread tosted with hony, in lykenes of a buttred lofe, and the great read worme. And take the blacke bloud in the harte of a shepe, and floure & hony, and tempre them altogether, somedele softer then past, and anoynt the read worme there with, bothe for this fyshhe and for other. And they wyll byte muche the better thereat, at all tymes. The perche is a deynteous fysshe, and passing holsome and after byting. These ben his baytes. In Marche the red worme. In Apryll the bobbe vnder the cow torde. In May the Hothorne worme, & the cod worme. In Iune the bayte that breedeth in an olde fallen oke, and the great canker. In Iuly the bayte that bredeth on the oyser lefe & the bob that bredeth on a dunghyll, & the hathorne worme & the codworme. In August the read worme & magottes, and all the yeare after take read worme for the best. The roche is an easy fyshhe to take, & if he be fat & penned then is he good meat & these ben his baytes. In marche the read worme. In Apryll the bobbe vnder the cowe torde. In may the bayte that breedeth on the oke lefe, and the bob on the dunghyll. In Iune the bayte that bredeth on oysyer & the codworm. In Iuly house spyes & the bait that bredeth on an oke & the nut worme, & mathewes, and maggots vnto mychelmas, & then after yt the fat of bako[n]. The Dace is a gentyl fyche to take & if it be wel refert then it is good meate. In March his bayte is a redworm. And in Apryll the bob vnder the cowtorde. In Maye the docke canker, & the bayte on the [h]othorne and on the oke lefe. In Iune the codworme & the bayte on the oyser, and the whyte grub in the dunghill. In Iuly take house spies & flyes yt breede in pismire hilles, the codworme & magots, vnto mychelmas, & if the water be clere, ye shall take fysshe when other take none, & from yt time forth do as ye do for ye roach, for com[m]o[n]ly it is sene yt their biting & baytes be lyke. The Bleke is but a feble fysshe, yet he is holso[m], his baytes from marche to michelmas be the same yt I haue write[n] before for the roche & the darse, sauing all yt somer season yt ye may angle for him with a house flie, & in winter seaso[n] wt bakon & other baite made as ye hereafter may know. The Ruf is a ryght and holsom fysshe, & ye shall angle to hym with the same baytes in a ll seasons of the yeare & in the same wyse as I haue told you of the perche, for they be lyke in fysshe and in feding, sauyng the ruf is lesse and therefore ye must haue the smaller bayte. The flounder is an holsome fysshe & a fre, & a subtyll byter in his maner. For commonly when he souketh his meate he fedeth at the ground, & therfore ye must angle to hym with a ground lyne lyeng, & he hath but one maner of bayte, & that is a red worme, & that moste chefe for all maner of fysshe. The Gugyn is a good fysshe of the mochenes, and he byteth well at the ground, and his baytes for all the yere ben these, the read worme, codworm & magottes & ye must angle to him wt a flote, and let youre bayte be nere the botome or els vpon the grounde. The menow whe[n] he shineth in the water, the[n] he is bitter, and though his body be but littel yet he is a rauenous byter and egre, and ye shall angle for him with the same baytes yt ye do for the gogon sauing they must be small. The Eele is a quaisy fysshe, a rauenous & deuourer of the broode of fysshe, & the pyke also is a devourer of fish. I put them both behynde al other for to angle, for this ele ye shall find an whole in ye grou[n] of water, & it is blew & blackish, there put in your hoke till yt it be a fote wtin the hole & your bayte shal be a great angle with a menow. The pyke is a good fisshe but for he deuoureth so many as wel of his owne kynde as of other, I loue him the lesse & for to take him ye shal do thus. Take a roche or a fresh hering, & a wyre with a hoke in the ende & put it in at the mouth, & on by the taile down by the ridge of the fresh herying, & than put your lyne of your hoke in after, and draw the hoke into the cheke of the fresh hering, tha[n] put a plu[m]be of lead vpon your lyne a yerde long from your hooke and a flote in mydway betwene, and cast it in a pyt where the pyke vse, and this is the best and moste surest craft to take the pyke. And three maner of taking him there is. Take a frosshe & put it on your hoke at the necke betweene the skin and the body, on the back half, & put on a flote a yerd there in, and cast it where the pike haunteth, & ye shall haue hym. Another maner, take the same bayte & put it in assafetida, & cast it into the water with a corde, and a corke, and ye shall not fayle of hym. And if ye lest to haue a good sport than tye the corde to a goose fote and ye shall se good halyng whether the goose or the pyke shall haue the better. Nowe ye wote with what baytes and how ye shall angle vnto euery maner of fisshe. Now I wil tel you how ye shall keepe and feede your quicke baytes, ye shall feede and keepe them all in generall, but euery maner by hym selfe with such things in and on which they brede. And as long as they be quicke & new they be fine. But whe[n] they haue bene in a sloughe or els dead than bene they nought. Out of these bene excepted three broodes, that is to wyte of Hornettes, Humblebees, and Waspes, Whoome ye shall bake in breade, and after dyppe their headdes in bloude and lette them drye. Also excepte magottes, whyche whan they be breed greate with their naturall feedyng, ye shall feede them forthermore with shepes talowe. [[ ... & wyth a cake made of floure & hony. thenne woll they be more grete. And whan you haue clensyd theym wyth sonde in a bagge of blanket kepte hote vnder your gowne or other warmm thyng two houres or thre, thenn ben they beste & redy to angle wyth. And of the frosshe kytte the legge by the knee. of the grasshop the leggys & wynges by the body. Thyse ben baytes made to laste all the yere. Fyrste been floure & lene flesh of the hepis of a cony or of a catte: virgyn wexe & shepys tallowe: and braye theym in a mortar: And thene tempre it at the fyre wyth a lytell puryfyed hony: & soo make it vp in lytyll ballys & bayte therwyth your hokys after theyr quantyte. & this is a good bayte for all manere fresshe fysshe. A nother, take the sewet of a shepe & cheese in lyke quantyte: & braye theim togider long in a mortere: And take thenne floure & tempre it therwyth. and after that alaye it wyth hony & make ballys therof. and that is for the barbell in especyall. A nother for darse, & roche & bleke. Take whete & sethe it well & thenne put it in blood all a daye & a nyghte, and it is a good bayte. For baytes for grete fyssh kepe specyally this rule. Whan ye haue take a grete fysshe: vndo the mawe. & what ye fynde therin make that your bayte: for it is beste. Thyse ben the .xij. flyes wyth whyche ye shall angle to ye trought and grayllyng and dubbe lyke as ye shall now here me tell. THe donne flye the body of the donne woll & the wyngis of the pertryche. A nother doone flye. the body of blacke woll: the wynges of the blackyst drake: and the Iay vnder the wynges & vnder the tayle. Apryll. The stone flye. the body of blacke wull: & yelowe vnder the wynge. and vnder the tayle & the wynges of the drake. In the begynnynge of May a good flye. the body of roddyd wull and lappid abowte wyth blacke sylke: the wynges of the drake & of the redde capons hakyll. May. The yelow flye. The body of yelow wull: the wynges of the redde cocke hakyll & of the drake lyttyd yelow. The blacke louper. the body of blacke wull & lappyd abowte wyth the herle of the pecok tayle: & the wynges of the redde capon wt a blewe heed. Iune. The donne cutte: the body of blacke wull & a yelow lyste after eyther syde: the wynges of the bosarde bounde on wyth barkyd hempe. The maure flye. the body of doske wull the wynges of the blackest mayle of the wylde drake. The tandy flye at saynt Wyllyams daye. the body of tandy & wull & the wynges contrary eyther ayenst other of the whitest mayle ofthe wylde drake. Iu[ly]. The waspe flye. The body of blacke wull & lappid abowte wt yelow threde: the winges of the bosarde. The shell flye at saynt Thomas daye. the body of grene wull & lappyd abowt wyth the herle of the pecoks tayle: wynges of the bosarde. Thyse fygures are put here in ensample of your hokes. Here folowyth the order made to all those whiche shall haue the vnderstondynge of this forsayde treatyse & vse it for theyr pleasures. And take good hede that in goyng about your disportes ye ope[n] no mans gates but that ye shyt them agayn. Also ye shal not vse this for said crafty disortes for no couetousnes, to the encreasing & sparing of your mony onely, but pryncypally for your solace, & to cause the helth of your body, & specially of your soule. For whe[n] you purpose to go on your disportes in fysshing, ye wyll not desyre greatlye many persons with you which might let you of your game. And then ye may serve God deuotedly in saying effectually your customable prayers. And thus doyng: ye shall eschewe and also auoyde many vyces, as ydelnes whiche is pryncypall cause to enduce man to many other vices as it is ryght well knowen. Also ye shall not be to rauenous in takyng of your sayde game, as too muche at one tyme whiche ye may lightly doo yf ye do in euery poynt as this present treatyse shewed you, whiche should lyghtly be the occasion to destroye your owne disportes and other mens also. And when ye haue a sufficient messe, ye should couet no more at that tyme, Also ye shal [helpe] your selfe to nouryshe the game in all that ye may and also to destroye all suche thynges as bene deuourers of it. And all those that dooth after this rule shall haue the blessyng of God and saynt Peter, whiche he them graunt that with his precious bloud vs bought. Amen. fysshyng, with other dyvers matters.